Total Chlorine test strips are most often used for testing drinking water from a city water treatment system. This test is very sensitive and reacts quickly to low levels of Total Chlorine. Total Chlorine test strips are most often used for testing drinking water from a city water treatment system. This test is very sensitive and reacts quickly to low levels of Total Chlorine. 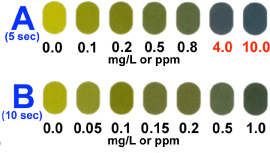 By varying the time (5 seconds or 10 seconds) of test strip exposure to the water sample, two concentration ranges (A or B) are available. This test reports concentrations of Total Chlorine as free chlorine plus chloramines. In some situations, Total Chlorine is tested to determine filtration effectiveness at removing chlorine from water. Total Chlorine B(10sec) 0.0, 0.05, 0.1, 1.5, 0.2, 0.5, 1.0 mg/L or ppm. Results are obtained from this test in 35 seconds. Background information on this test # 125 Total Chlorine in Water is available as a PDF download.